Le Cordon Bleu Paris Chefs suggest an elegant and refreshing peach flavoured dessert for a change of seasons. A ray of sunshine on your plate. Preheat the oven to 150 °C. Roll out the dough to a thickness of 4 mm, stamp out 6 disks with the 6 cm diameter cutter. Place the disks onto a parchment paper lined baking tray. Bake in the oven for 15 minutes, remove and cool on a cake rack. Increase oven temperature to 200 °C. Whisk together the eggs, ground almonds, icing sugar and flour. Add the warm melted butter. Whisk the egg whites to soft peaks then gradually incorporate the sugar in two additions. Use a spatula to fold the meringue egg whites into the first mixture. Spread onto a parchment lined baking tray to 1 cm thick. Bake in the oven for 6 to 8 minutes. Remove and cool. Stamp out 6 x 6 cm diameter disks and 6 x 4.5 cm disks. Peel the peaches, place in boiling water for 16 seconds, refresh in iced water. Remove the skin and cut into pieces . Place the pieces into a saucepan with the sugar and vanilla pod. Cook over low heat for about 10 to 15 minutes. Mix the corn starch in a bowl with one tablespoon of water, stir into the compote. Stir to the boil and cook for 3 minutes. Remove from the heat, cool and set aside. Soften the gelatin leaves in cold water. Heat the peach purée and sugar in a saucepan. Squeeze the excess water from the gelatin leaves and stir into the peach purée, off the heat to dissolve. Pour into a bowl and leave to cool. Whisk the cream to soft peaks; whisk one third into the peach purée. When homogenous gently fold in the remaining whipped cream. Lastly fold in the peach compote. Lightly dust a work surface with icing sugar. Roll the fondant to 2 mm thick. Using a cutter of your choice stamp out decorations and set aside on parchment paper. Oil the half-sphere imprints and place 2 teaspoons of peach mousse into each imprint, spreading up the sides to coat. Place a small disk (4.5 cm) of Joconde biscuit on top of the mousse. Fill each with peach mousse to ½ cm from the top. Cover with the 6 cm disk of Joconde biscuit. Spread a spoonful of peach mousse uniformly on top. Place in the freezer for 12 hours. Unmold the frozen domes onto a cake rack with the aid of a hot sponge pressed against the molds. Place each dome onto a disk of sweet pastry. Decorate with reserved fondant shapes. 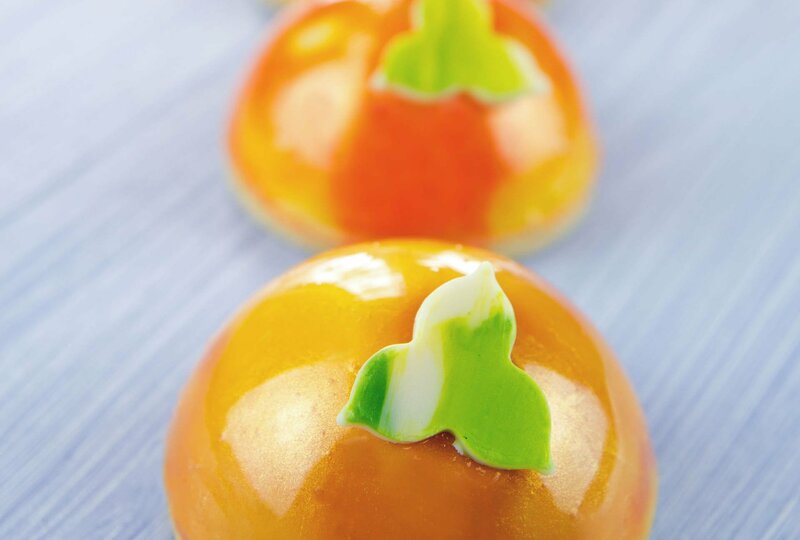 The peach dome is above all a treat which combines the summery sweetness of perfectly ripe fruit with the contrasting textures that make it so special. This preparation is incredibly well done, and great care has been taken to balance the flavour intensity, make sure the Joconde sponge is light and above all keep the sweetness level down. There is just one nectar which can echo the mastery of this preparation, the legendary Wine of Constancia from Domaine Klein Constantia in South Africa. A unique wine, enjoyed by Napoléon, Frederic the Great, or the crowned heads of Buckingham Palace. A beverage which flows like liquid gold, just as bright, just as precious softly emanating hints of marmalade, candied apricots, frangipane and cinnamon. The exuberant array of aromas is equally present on the palate and will harmonize with the Peach Dome. This powerful and concentrated wine is delicious because its extraordinary natural sweetness is balanced by natural acidity which is refreshingly mouthwatering. The sensation is one of comfort, softness and real enjoyment giving a fusion wine pairing in which South Africa and France come together to celebrate excellence and perfect knowhow.